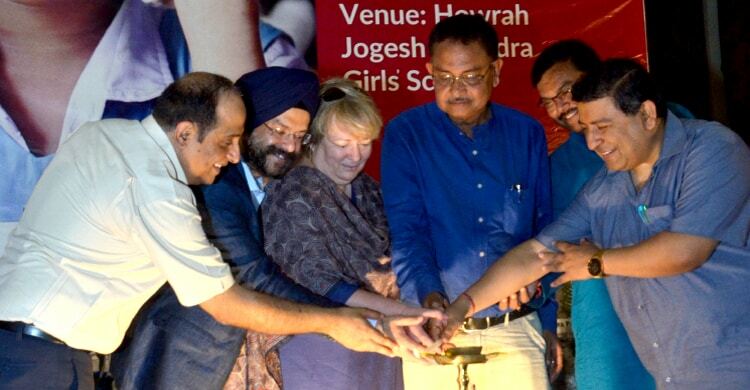 Taking a step towards empowering the girl child, Sightsavers with the support of Baxter and in collaboration with Susrut Eye Foundation and Research Centre inaugurated its Vidyajyoti All Girls’ School Eye Health Programme at Howrah Jogesh Chandra Girls’ School, West Bengal. The programme subsequently will be implemented in the Howrah District of West Bengal. Although Howrah is adjacent to Kolkata, the developmental indicators are still far below the national average. This programme was conceived to integrate a strong gender component along with eye health. Therefore, girls schools were selected as a potential target group. Baxter International Incorporation is supporting it. The core covering strength of the programme is to implement it in an ‘empowerment model’ where school children will be offered a plethora of health education combining Eye health, Life Skills and Menstrual Hygiene. Eye health too, just like any other health aspect remains particularly neglected in women whereas un-addressed eye health issues have the exclusive power to push a girl child towards more marginalization, backwardness and in turn dependency. The programme model has kept in mind the needs of the community in view and engaged female health educators and ophthalmic staff to create an enabling learning environment where the girls feel safe and comfortable. The programme was inaugurated by Dr Rathin Chakraborty-Mayor Howrah Municipal Corporation, Mr Bhaskar Bhattacharya-Member-Mayor In council-Health, Dr Caroline Harper-Chief Executive-Sightsavers, Mr Ravinder Dang-General Manager-Baxter India and Dr Ratish Chandra Paul-Secretary-Susrut Eye Foundation and Research Centre along with Mr RN Mohanty, CEO Sightsavers India. “The project will contribute to the SDG goals of ‘Good health and well-being’, ‘Quality Education’, and ‘Gender Equality’ and also add to the Vision 2020 priority of addressing refractive error which is the biggest cause of visual impairment among children,” said Mr RN Mohanty, CEO Sightsavers India. “Baxter is proud to be associated with Sightsavers as they give both children and adults the opportunity to correct their sight and prevent avoidable blindness. Through this programme, Baxter seeks to support about 85,000 girls over the course of next three years to enable them to see clearly,” said Mr Ravinder Dang, General Manager, Baxter India. Addressing the enthusiastic young audience, Dr Caroline Harper, Chief Executive Sightsavers encouraged the girls on how being a girl they should be ambitious and dream big. “You all need to dream big and for that you ought to work hard and study. To ensure that there is no hindrance to your studying do get your eyes screened. It was at a school screening that I too got to know about my weak eyes. So, I still wear contact lenses today. Had it not been for the school eye screening intervention, I may not have been able to study well and be here addressing all of you,” said Dr Harper.